"Coptic Church" redirects here. For the architectural style, see Coptic architecture. 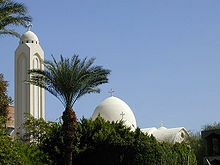 For church buildings, see List of Coptic churches. The Coptic Orthodox Church of Alexandria (Coptic: Ϯⲉⲕ̀ⲕⲗⲏⲥⲓⲁ ̀ⲛⲣⲉⲙ̀ⲛⲭⲏⲙⲓ ⲛⲟⲣⲑⲟⲇⲟⲝⲟⲥ, translit. ti.eklyseya en.remenkimi en.orthodoxos, lit. 'The Egyptian Orthodox Church') is an Oriental Orthodox Christian church based in Egypt, Africa and the Middle East. The head of the Church and the See of Alexandria is the Patriarch of Alexandria on the Holy See of Saint Mark, who also carries the title of Coptic Pope. The See of Alexandria is titular, and today the Coptic Pope presides from Saint Mark's Coptic Orthodox Cathedral in the Abbassia District in Cairo. The church follows the Alexandrian Rite for its liturgy, prayer and devotional patrimony. With 20–25 million members worldwide, whereof about 18 to 22 million are in Egypt, it is the country's largest Christian church. This article contains Coptic text. Without proper rendering support, you may see question marks, boxes, or other symbols instead of Coptic letters. According to its tradition, the Coptic Church was established by Saint Mark, an apostle and evangelist, during the middle of the 1st century (c. AD 42). Due to disputes concerning the nature of Christ, it split from the rest of the Christendom after the Council of Chalcedon in AD 451, resulting in a rivalry with the Byzantine Orthodox Church. 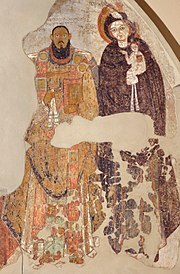 In the 4–7th centuries the Coptic Church gradually expanded due to the Christianization of the Aksumite empire and of two of the three Nubian kingdoms, Nobatia and Alodia, while the third Nubian kingdom, Makuria, recognized the Coptic patriarch after initially being aligned to the Byzantine Orthodox Church. After AD 639 Egypt was ruled by its Islamic conquerors from Arabia, and the treatment of the Coptic Christians ranged from tolerance to open persecution. In the 12th century, the church relocated its seat from Alexandria to Cairo. The same century also saw the Copts become a religious minority. During the 14th and 15th centuries, Nubian Christianity was supplanted by Islam. In 1959, the Ethiopian Orthodox Tewahedo Church was granted autocephaly or independence. This was extended to the Eritrean Orthodox Tewahedo Church in 1998 following the successful Eritrean War of Independence from Ethiopia. Since the Arab Spring in 2011, the Copts have been suffering increased religious discrimination and violence. 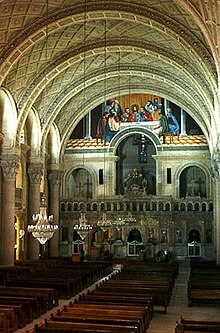 The Egyptian Church is traditionally believed to be founded by St Mark at around AD 42, and regards itself as the subject of many prophecies in the Old Testament. Isaiah the prophet, in Chapter 19, Verse 19 says "In that day there will be an altar to the LORD in the midst of the land of Egypt, and a pillar to the LORD at its border". The first Christians in Egypt were common people who spoke Egyptian Coptic. There were also Alexandrian Jewish people such as Theophilus, whom Saint Luke the Evangelist addresses in the introductory chapter of his gospel. When the church was founded by Saint Mark during the reign of the Roman emperor Nero, a great multitude of native Egyptians (as opposed to Greeks or Jews) embraced the Christian faith. Christianity spread throughout Egypt within half a century of Saint Mark's arrival in Alexandria, as is clear from the New Testament writings found in Bahnasa, in Middle Egypt, which date around the year AD 200, and a fragment of the Gospel of John, written in Coptic, which was found in Upper Egypt and can be dated to the first half of the 2nd century. In the 2nd century, Christianity began to spread to the rural areas, and scriptures were translated into the local languages, namely Coptic. The Coptic language is a universal language used in Coptic churches in every country. It is derived from ancient Egyptian and uses Greek letters. Many of the hymns in the liturgy are in Coptic and have been passed down for several thousand years. The language is used to preserve Egypt's original language, which was banned by the Arab invaders, who ordered Arabic to be used instead. Some examples of these hymns are Coptic: Ⲡⲟⳙⲣⲟ, translit. ep.ouro, lit. 'The King',Coptic: Ⲉⲕⲥⲙⲁⲣⲱⲟⲩⲧ, translit. ek.esmaro'oot, lit. '(Thou) Blessed', Coptic: Ⲧⲁⲓϣⲟⲩⲣⲏ, translit. tai.shouri, lit. 'This Censer', and many more. The Catechetical School of Alexandria is the oldest catechetical school in the world. St. Jerome records that the Christian School of Alexandria was founded by Saint Mark himself. Around AD 190, under the leadership of the scholar Pantanaeus, the school of Alexandria became an important institution of religious learning, where students were taught by scholars such as Athenagoras, Clement, Didymus, and the native Egyptian Origen, who was considered the father of theology and who was also active in the field of commentary and comparative Biblical studies. The Theological college of the catechetical school was re-established in 1893. The new school currently has campuses in Ireland, Cairo, New Jersey, and Los Angeles, where Coptic priests-to-be and other qualified men and women are taught among other subjects Christian theology, history, the Coptic language and art – including chanting, music, iconography, and tapestry. Many Egyptian Christians went to the desert during the 3rd century, and remained there to pray and work and dedicate their lives to seclusion and worship of God. This was the beginning of the monastic movement, which was organized by Anthony the Great, Saint Paul of Thebes, the world's first anchorite, Saint Macarius the Great and Saint Pachomius the Cenobite in the 4th century. All Christian monasticism stems, either directly or indirectly, from the Egyptian example: Saint Basil the Great Archbishop of Caesarea of Cappadocia, founder and organizer of the monastic movement in Asia Minor, visited Egypt around AD 357 and his rule is followed by the Eastern Orthodox Churches; Saint Jerome who translated the Bible into Latin, came to Egypt, while en route to Jerusalem, around AD 400 and left details of his experiences in his letters; Benedict founded the Benedictine Order in the 6th century on the model of Saint Pachomius, but in a stricter form. Countless pilgrims have visited the "Desert Fathers" to emulate their spiritual, disciplined lives. In the 4th century, an Alexandrian presbyter named Arius began a theological dispute about the nature of Christ that spread throughout the Christian world and is now known as Arianism. The Ecumenical Council of Nicea AD 325 was convened by Constantine after the Pope Alexander I of Alexandria requested to hold a Council to respond to heresies, under the presidency of Saint Hosius of Cordova to resolve the dispute. This eventually led to the formulation of the Symbol of Faith, also known as the Nicene Creed. The Creed, which is now recited throughout the Christian world, was based largely on the teaching put forth by a man who eventually would become Pope Saint Athanasius of Alexandria, the chief opponent of Arius. We believe in the Holy Spirit, the Lord, the Giver of Life, who proceeds from the Father, who with the Father through the Son is worshiped and glorified who spoke by the Prophets and in One, Holy, Catholic, and Apostolic church. We confess one Baptism for the remission of sins and we look for the resurrection of the dead and the life of the coming age, Amen. Another theological dispute in the 5th century occurred over the teachings of Nestorius, the Patriarch of Constantinople who taught that God the Word was not hypostatically joined with human nature, but rather dwelt in the man Jesus. As a consequence of this, he denied the title "Mother of God" (Theotokos) to the Virgin Mary, declaring her instead to be "Mother of Christ" Christotokos. When reports of this reached the Apostolic Throne of Saint Mark, Pope Saint Cyril I of Alexandria acted quickly to correct this breach with orthodoxy, requesting that Nestorius repent. When he would not, the Synod of Alexandria met in an emergency session and a unanimous agreement was reached. Pope Cyril I of Alexandria, supported by the entire See, sent a letter to Nestorius known as "The Third Epistle of Saint Cyril to Nestorius." This epistle drew heavily on the established Patristic Constitutions and contained the most famous article of Alexandrian Orthodoxy: "The Twelve Anathemas of Saint Cyril." In these anathemas, Cyril excommunicated anyone who followed the teachings of Nestorius. For example, "Anyone who dares to deny the Holy Virgin the title Theotokos is Anathema!" Nestorius however, still would not repent and so this led to the convening of the First Ecumenical Council of Ephesus (AD 431), over which Cyril presided. When in AD 451 Emperor Marcian attempted to heal divisions in the Church, the response of Pope Dioscorus – the Pope of Alexandria who was later exiled – was that the emperor should not intervene in the affairs of the Church. It was at Chalcedon that the emperor, through the Imperial delegates, enforced harsh disciplinary measures against Pope Dioscorus in response to his boldness. In AD 449, Pope Dioscorus headed the 2nd Council of Ephesus, called the "Robber Council" by Chalcedonian historians. It held to the Miaphysite formula which upheld the Christology of "One Incarnate Nature of God the Word" (Greek: μία φύσις Θεοῦ Λόγου σεσαρκωμένη (mia physis Theou Logou sesarkōmenē)), and upheld the heretic Eutyches claiming he was orthodox. The Council of Chalcedon summoned Dioscorus three times to appear at the council, after which he was deposed. The Council of Chalcedon further deposed him for his support of Eutyches, but not necessarily for Eutychian Monophysitism. Dioscorus appealed to the conciliar fathers to allow for a more Miaphysite interpretation of Christology at the council, but was denied. Following his being deposed, the Coptic Church and its faithful felt unfairly underrepresented at the council and oppressed politically by the Byzantine Empire. After the Byzantines appointed Proterius of Alexandria as Patriarch to represent the Chalcedonian Church, the Coptic Church appointed their own Patriarch Timothy Aelurus and broke from the Chalcedonian communion. The Council of Chalcedon, from the perspective of the Alexandrine Christology, has deviated from the approved Cyrillian terminology and declared that Christ was one hypostasis in two natures. However, in the Nicene-Constantinopolitan Creed, "Christ was conceived of the Holy Spirit and of the Virgin Mary," thus the foundation of the definition according to the Non-Chalcedonian adherents, according to the Christology of Cyril of Alexandria is valid. There is a change in the Non-Chalcedonian definition here, as the Nicene creed clearly uses the terms "of", rather than "in." In terms of Christology, the Oriental Orthodox (Non-Chalcedonians) understanding is that Christ is "One Nature—the Logos Incarnate," of the full humanity and full divinity. The Chalcedonians' understanding is that Christ is recognized in two natures, full humanity and full divinity. Oriental Orthodoxy contends that such a formulation is no different from what the Nestorians teach. This is the doctrinal perception that makes the apparent difference which separated the Oriental Orthodox from the Eastern Orthodox. The Council's findings were rejected by many of the Christians on the fringes of the Byzantine Empire, including Egyptians, Syriacs, Armenians, and others. From that point onward, Alexandria would have two patriarchs: the non-Chalcedonian native Egyptian one, now known as the Coptic Pope of Alexandria and Patriarch of All Africa on the Holy Apostolic See of St. Mark, and the Melkite or Imperial Patriarch, now known as the Greek Orthodox Patriarch of Alexandria. Almost the entire Egyptian population rejected the terms of the Council of Chalcedon and remained faithful to the native Egyptian Church (now known as the Coptic Orthodox Church of Alexandria). Those who supported the Chalcedonian definition remained in communion with the other leading imperial churches of Rome and Constantinople. The non-Chalcedonian party became what is today called the Oriental Orthodox Church. The Coptic Orthodox Church of Alexandria regards itself as having been misunderstood at the Council of Chalcedon. There was an opinion in the Church that viewed that perhaps the Council understood the Church of Alexandria correctly, but wanted to curtail the existing power of the Alexandrine Hierarch, especially after the events that happened several years before at Constantinople from Pope Theophilus of Alexandria towards Patriarch John Chrysostom and the unfortunate turnouts of the Second Council of Ephesus in AD 449, where Eutychus misled Pope Dioscorus and the Council in confessing the Orthodox Faith in writing and then renouncing it after the Council, which in turn, had upset Rome, especially that the Tome which was sent was not read during the Council sessions. To make things even worse, the Tome of Pope Leo of Rome was, according to the Alexandria School of Theology, particularly in regards to the definition of Christology, considered influenced by Nestorian heretical teachings. So, due to the above-mentioned, especially in the consecutive sequences of events, the Hierarchs of Alexandria were considered holding too much of power from one hand, and on the other hand, due to the conflict of the Schools of Theology, there would be an impasse and a scapegoat, i.e. Pope Dioscorus. The Tome of Leo has been widely criticized (surprisingly by Roman Catholic and Eastern Orthodox scholars) in the past 50 years as a much less than perfect orthodox theological doctrine. It is also to be noted that by anathematizing Pope Leo because of the tone and content of his tome, as per Alexandrine Theology perception, Pope Dioscorus was found guilty of doing so without due process; in other words, the Tome of Leo was not a subject of heresy in the first place, but it was a question of questioning the reasons behind not having it either acknowledged or read at the Second Council of Ephesus in AD 449. Pope Dioscorus of Alexandria was never labeled as heretic by the council's canons. Prior to Chalcedon, the Imperial Church's main division stemmed from Nestorianism, eventually leading the Church of the East to declare its independence in AD 424. After the Council of Chalcedon in AD 451, the Coptic Church and its hierarchy felt suspicious of what they believed were Nestorian elements within the Chalcedonian Church. As a result, the anti-Chalcedon partisan, Timotheos Aelurus, consigned himself to depose the Chalcedonian Pope of Alexandria, Proterius of Alexandria, and to set himself up as the Pope of Alexandria in opposition to the entire Chalcedonian Church of the Byzantine Empire. Copts suffered under the rule of the Byzantine Empire. The Melkite Patriarchs, appointed by the emperors as both spiritual leaders and civil governors, massacred those Egyptians they considered heretics. Many were tortured and martyred in attempts to force their acceptance of the Chalcedonian terms, but the Egyptians remained loyal to the Cyrillian Miaphysitism. One of the most renowned Egyptian saints of the period is Saint Samuel the Confessor. The Muslim invasion of Egypt took place in AD 639. Despite the political upheaval, the Egyptian population remained mainly Christian. However, gradual conversions to Islam over the centuries had changed Egypt from a Christian to a largely Muslim country by the end of the 12th century. Egypt's Umayyad rulers taxed Christians at a higher rate than Muslims, driving merchants towards Islam and undermining the economic base of the Coptic Church. Although the Coptic Church did not disappear, the Umayyad tax policies made it difficult for the church to retain the Egyptian elites. The Church suffered greatly under the many regimes of Islamic rule. Sometime during the 2nd millennium AD, the leadership of the Church, including the Pope, moved from Alexandria to Cairo. The position of Copts began to improve early in the 19th century under the stability and tolerance of the Muhammad Ali Dynasty. The Coptic community ceased to be regarded by the state as an administrative unit. In 1855 the jizya tax was abolished. Shortly thereafter, the Copts started to serve in the Egyptian army. Towards the end of the 19th century, the Coptic Church underwent phases of new development. In 1853, Pope Cyril IV established the first modern Coptic schools, including the first Egyptian school for girls. He also founded a printing press, which was only the second national press in the country. The Pope established very friendly relations with other denominations, to the extent that when the Greek Patriarch in Egypt had to absent himself from the country for a long period of time, he left his Church under the guidance of the Coptic Patriarch. The Theological College of the School of Alexandria was reestablished in 1893. It began its new history with five students, one of whom was later to become its dean. Today it has campuses in Alexandria and Cairo, and in various dioceses throughout Egypt, as well as outside Egypt. It has campuses in New Jersey, Los Angeles, Sydney, Melbourne, and London, where potential clergymen and other qualified men and women study many subjects, including theology, church history, missionary studies, and the Coptic language. A modern Coptic cathedral in Aswan. In 1959, the Ethiopian Orthodox Tewahedo Church was granted its first own Patriarch by Pope Cyril VI. Furthermore, the Eritrean Orthodox Tewahedo Church similarly became independent of the Ethiopian Orthodox Tewahedo Church in 1994, when four bishops were consecrated by Pope Shenouda III of Alexandria to form the basis of a local Holy Synod of the Eritrean Church. In 1998, the Eritrean Orthodox Tewahedo Church gained its autocephaly from the Coptic Orthodox Church when its first Patriarch was enthroned by Pope Shenouda III of Alexandria. These three churches remain in full communion with each other and with the other Oriental Orthodox churches. The Ethiopian Orthodox Tewahedo Church and the Eritrean Orthodox Tewahedo Church do acknowledge the Honorary Supremacy of the Coptic Orthodox Patriarch of Alexandria, since the Church of Alexandria is technically their Mother Church. Upon their selection, both Patriarchs (Ethiopian & Eritrean) must receive the approval and communion from the Holy Synod of the Apostolic See of Alexandria before their enthronement. Since the 1980s theologians from the Oriental (non-Chalcedonian) Orthodox and Eastern (Chalcedonian) Orthodox churches have been meeting in a bid to resolve theological differences, and have concluded that many of the differences are caused by the two groups using different terminology to describe the same thing (see Agreed Official Statements on Christology with the Eastern Orthodox Churches). In the summer of 2001, the Coptic Orthodox and Greek Orthodox Patriarchates of Alexandria agreed to mutually recognize baptisms performed in each other's churches, making re-baptisms unnecessary, and to recognize the sacrament of marriage as celebrated by the other. Previously, if a Coptic Orthodox and Greek Orthodox wanted to get married, the marriage had to be performed twice, once in each church, for it to be recognized by both. Now it can be done in only one church and be recognized by both. According to Christian Tradition and Canon Law, the Coptic Orthodox Church of Alexandria only ordains men to the priesthood and episcopate, and if they wish to be married, they must be married before they are ordained. In this respect they follow the same practices as all other Oriental Orthodox Churches, as well as all of Eastern Orthodox Churches. Traditionally, the Coptic language was used in church services, and the scriptures were written in the Coptic alphabet. However, due to the Arabisation of Egypt, service in churches started to witness increased use of Arabic, while preaching is done entirely in Arabic. Native languages are used, in conjunction with Coptic, during services outside Egypt. The liturgical calendar of the Coptic Orthodox Church is the Coptic calendar (also called the Alexandrian Calendar). This calendar is based on the Egyptian calendar of Ancient Egypt. Coptic Orthodox Christians celebrate Christmas on 29 Koiak, which corresponds to 7 January in the Gregorian Calendar and 25 December in the Julian Calendar. Coptic Christmas was adopted as an official national holiday in Egypt in 2002. In Tahrir Square, Cairo, on Wednesday 2 February 2011, Coptic Christians joined hands to provide a protective cordon around their Muslim neighbors during salat (prayers) in the midst of the 2011 Egyptian Revolution. On 17 March 2012, the Coptic Orthodox Pope, Pope Shenouda III died, leaving many Copts mourning and worrying as tensions rose with Muslims. Pope Shenouda III constantly met with Muslim leaders in order to create peace. Many were worried about Muslims controlling Egypt as the Muslim Brotherhood won 70% of the parliamentary elections. On 4 November 2012, Bishop Tawadros was chosen as the 118th Pope. In a ritual filled with prayer, chants and incense at Abbasiya cathedral in Cairo, the 60-year-old bishop's name was picked by a blindfolded child from a glass bowl in which the names of two other candidates had also been placed. The enthronement was scheduled on 18 November 2012. Pope Tawadros II of Alexandria of the Coptic Orthodox Church revived Ignatius Aphrem II Patriarch of Antioch and All East of the Syriac Orthodox Church Aram I Catholicose of Cilicia of the Armenian Apostolic Orthodox Church in Lebanon. There are about 20 million Coptic Orthodox Christians in the world. Between 15 and 18 million of them are found in Egypt under the jurisdiction of the Coptic Orthodox Church of Alexandria. Since Egypt does not have an official government census on religion, estimates of the size of Egypt's Christian population vary from the estimated low previous government figures of 6 to 7 million to the 12 million reported by some Christian leaders in 2008. The actual numbers may be in the 15 to 18 million range, out of an Egyptian population of more than 90 million. However, in 2011, the Pew Research Center announced that Copts in Egypt constitute 4.5% of the population, while the Catholic Holy See puts Copts at 6 to 8%. Then in 2017 government owned news Al Ahram estimated the percentage of Copts at 10 to 15%. However, in 2012 after the Egyptian revolution the Muslim Brotherhood was drafting new constitution then Major-General Abu Bakr al-Guindi claimed that the lower figures support a downward trend in the percentage of Copts in Egypt, as recorded in consecutive estimated Egyptian censuses since a 1927 high where Egyptian Christians formed 8.3% of the population. This decline has been explained by Major-General Abu Bakr al-Guindi, head of Egypt's Central Agency for Public Mobilization and Statistics, as being the result of Copts having the highest emigration rate, the lowest birthrate and the highest income level in the country. However, this statement and population count has been rejected by the Coptic Church. There are also significant numbers in the diaspora outside Africa in countries such as the United States, Canada, Australia, France, and Germany. The number of Coptic Orthodox Christians in the diaspora is roughly 2 million. In addition, there are between 350,000 and 400,000 native African adherents in East, Central and South Africa, most in Sudan, whose population is less than 200,000. Although under the jurisdiction of the Coptic Orthodox Church, these adherents are not considered Copts, since they are not ethnic Egyptians. Some accounts regard members of the Ethiopian Orthodox Tewahedo Church (roughly 45 million), the Eritrean Orthodox Tewahedo Church (roughly 2.5 million), as members of the Coptic Orthodox Church. This is however a misnomer, since both the Ethiopian and the Eritrean Churches, although daughter churches of the Church of Alexandria, are currently autocephalous churches. While Copts have cited instances of persecution throughout their history, Human Rights Watch has noted "growing religious intolerance" and sectarian violence against Coptic Christians in recent years, and a failure by the Egyptian government to effectively investigate properly and prosecute those responsible. Over a hundred Egyptian copts have been killed in sectarian clashes from 2011 to 2017, and many homes and businesses destroyed. In just one province (Minya), 77 cases of sectarian attacks on Copts between 2011 and 2016 have been documented by the Egyptian Initiative for Personal Rights. The abduction and disappearance of Coptic Christian women and girls also remains a serious ongoing problem. Besides Egypt, the Church of Alexandria has jurisdiction over all of Africa. 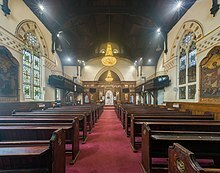 In addition, the Ethiopian Orthodox Tewahedo Church and Eritrean Orthodox Tewahedo Church are daughter churches of the Coptic Orthodox Church of Alexandria. Both the Patriarchate of Addis Ababa and all Ethiopia and the Patriarchate of Asmara and all Eritrea acknowledge the supremacy of honor and dignity of the Pope of Alexandria on the basis that both patriarchates were established by the Throne of Alexandria and that they have their roots in the Apostolic Church of Alexandria, and acknowledge that Saint Mark the Apostle is the founder of their Churches through the heritage and Apostolic evangelization of the Fathers of Alexandria. Ethiopia received Christianity next to Jerusalem, through Jesus's own apostle, only a year after Jesus was crucified (Acts 8: 26–39). Christianity became a national religion of Ethiopia, under the dominion of the Church of Alexandria, in the 4th century. The first bishop of Ethiopia, Saint Frumentius, was consecrated as Bishop of Axum by Pope Athanasius of Alexandria in AD 328. From then on, until 1959, the Pope of Alexandria, as Patriarch of All Africa, always named an Egyptian (a Copt) to be the Archbishop of the Ethiopian Church. On 13 July 1948, the Coptic Church of Alexandria and the Ethiopian Orthodox Tewahedo Church reached an agreement concerning the relationship between the two churches. In 1950, the Ethiopian Orthodox Tewahedo Church was granted autocephaly by Pope Joseph II of Alexandria, head of the Coptic Orthodox Church. Five Ethiopian bishops were immediately consecrated by the Pope of Alexandria and Patriarch of All Africa, and were empowered to elect a new Patriarch for their church. This promotion was completed when Joseph II consecrated the first Ethiopian-born Archbishop, Abuna Basilios, as head of the Ethiopian Church on 14 January 1951. In 1959, Pope Cyril VI of Alexandria crowned Abuna Basilios as the first Patriarch of Ethiopia. Patriarch Basilios died in 1971, and was succeeded on the same year by Abuna Theophilos. With the fall of Emperor Haile Selassie I of Ethiopia in 1974, the new Marxist government arrested Abuna Theophilos and secretly executed him in 1979. The Ethiopian government then ordered the Ethiopian Church to elect Abuna Takla Haymanot as Patriarch of Ethiopia. The Coptic Orthodox Church refused to recognize the election and enthronement of Abuna Takla Haymanot on the grounds that the Synod of the Ethiopian Church had not removed Abuna Theophilos, and that the Ethiopian government had not publicly acknowledged his death, and he was thus still legitimate Patriarch of Ethiopia. Formal relations between the two churches were halted, although they remained in communion with each other. After the death of Abuna Takla Haymanot in 1988, Abune Merkorios who had close ties to the Derg (Communist) government was elected Patriarch of Ethiopia. Following the fall of the Derg regime in 1991, Abune Merkorios abdicated under public and governmental pressure and went to exile in the United States. The newly elected Patriarch, Abune Paulos was officially recognized by the Coptic Orthodox Church of Alexandria in 1992 as the legitimate Patriarch of Ethiopia. Formal relations between the Coptic Church of Alexandria and the Ethiopian Orthodox Tewahedo Church were resumed on 13 July 2007. Abune Paulos died in August 2012. Following the independence of Eritrea from Ethiopia in 1993, the newly independent Eritrean government appealed to Pope Shenouda III of Alexandria for Eritrean Orthodox autocephaly. In 1994, Pope Shenouda ordained Abune Phillipos as first Archbishop of Eritrea. The Eritrean Orthodox Tewahedo Church obtained autocephaly on 7 May 1998, and Abune Phillipos was subsequently consecrated as first Patriarch of Eritrea. The two churches remain in full communion with each other and with the other Oriental Orthodox Churches, although the Coptic Orthodox Church of Alexandria, along with the Ethiopian Orthodox Tewahedo Church does not recognize the deposition of the third Patriarch of Eritrea, Abune Antonios. 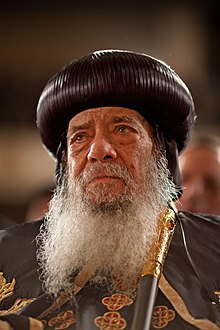 Pope Shenouda III, the 117th Patriarch of Alexandria on the Holy Apostolic See of Saint Mark the Evangelist (1971–2012). The leader of the Coptic Orthodox Church of Alexandria is known as Pope of Alexandria and Patriarch of all Africa on the Holy See of St. Mark the Apostle. His full title is Patriarch and Lord Archbishop of the Great City of Alexandria on the Holy Orthodox and Apostolic Throne of Saint Mark the Evangelist and Holy Apostle that is, in Egypt, Pentapolis, Libya, Nubia, Sudan, Ethiopia, Eritrea and all Africa. The Successor of St. Mark the Evangelist, Holy Apostle and Martyr, on the Holy Apostolic Throne of the Great City of Alexandria. Pope of Alexandria, being the Diocesan Bishop of the Great and Ancient Metropolis of Alexandria, that is in Alexandria and the metropolitan province of Greater Cairo. Elder Metropolitan Archbishop of the Egyptian Province. Primate of Egypt, Pentapolis, Libya, Nubia and Sudan. The Dean of the Great Catechetical School of Theology of Alexandria. The Ecumenical (Universal) Judge (Arbitrator) of the Holy Apostolic and Catholic (Universal) Church. The 13th among the Holy Apostles. The Pillar and Defender of the Holy, Catholic (Universal), Apostolic Church and of the Orthodox Doctrine. The patriarch of Alexandria was originally known merely as bishop of Alexandria. However, this title continued to evolve as the Church grew under Theophilus and his nephew and successor Cyril (AD 376–444), and especially in the 5th century when the Church developed its hierarchy. The bishop of Alexandria, being the successor of the first bishop in Roman Egypt consecrated by Saint Mark, was honored by the other bishops as first among equals primus inter pares. Under the sixth canon of the Council of Nicaea, Cyril was raised to prelate or chief bishop at the head of the episcopates of Egypt, Libya, and the Pentapolis without the existence of intermediate archbishops as existed in other ecclesiastic provinces. He had the privilege of choosing and consecrating bishops. The title of "pope" has been attributed to the Patriarch of Alexandria since the episcopate of Heraclas, the 13th Patriarch of Alexandria. All the clergy of Alexandria and Lower Egypt honored him with the title papas, which means "father" as the archbishop and metropolitan having authority over all bishops, within the Egyptian province, who are under his jurisdiction. Alexandria, while the ecclesiastical and provincial capital, also had the distinction as being the place where Saint Mark was martyred. The title "Patriarch" originally referred to a clan leader or head of a familial lineage. Ecclesiastically it means a bishop of high rank and was originally used as a title for the bishops of Rome, Constantinople, Jerusalem, Antioch, and Alexandria. For the Coptic patriarch, this title was "Patriarch of Alexandria and all Africa on the Holy Apostolic Throne of Saint Mark the Evangelist," that is "of Egypt". The title of "Patriarch" was first used around the time of the Third Ecumenical Council of Ephesus, convened in AD 431, and ratified at Chalcedon in AD 451. It is to be noted that only the Patriarch of Alexandria has the double title of "Pope" and "Patriarch" among the Eastern Orthodox and Oriental Orthodox ecumenical church heads. 15 metropolitanates, out of which 12 metropolitanates are in Egypt, one metropolitanate in the Near East, one in Europe, one in the US; served by two metropolitan archbishops and 13 metropolitan bishops; out of the 13 hierarchs, one metropolitan archbishop is in the Near East, one metropolitan archbishop in Egypt, while 11 metropolitan bishops are in Egypt, one metropolitan bishop in Europe, and one metropolitan bishop in the US. 65 dioceses with 40 diocesan bishops are in Egypt, 13 diocesan bishops are in Europe, six diocesan bishops are in North America, two diocesan bishops are in South America, two diocesan bishops are in Sudan, and finally two diocesan bishops are in Australia. one suffragan dioceses, with one suffragan bishop in North America. six auxiliary bishops, with two auxiliary bishops for dioceses in Egypt and four auxiliary bishops in North America. 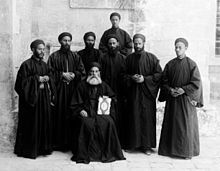 eight patriarchal exarchates, with two patriarchal exarchs in Africa, two patriarchal exarchs in North America, one patriarchal exarchs in Europe and three patriarchal exarchs in Egypt. two general bishops, patriarchal emissary at large in Egypt and abroad. four general bishops, administrators of patriarchal institutions in Egypt. one hegumen in the capacity of grand economos, patriarchal vicar for Alexandria. one hegumen as administrative patriarchal vicar for Cairo. ^ "New Egyptian Constitution Holds Promise for Copts". National Catholic Register. Retrieved 19 March 2019. 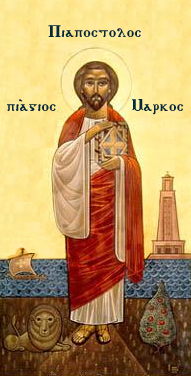 ^ a b Eusebius of Caesarea, the author of Ecclesiastical History in the 4th century, states that Saint Mark came to Egypt in the first or third year of the reign of Emperor Claudius, i.e. AD 41 or 43 Otto Friedrich August Meinardus (2002). Two Thousand Years of Coptic Christianity. American Univ in Cairo Press. p. 28. ISBN 978-977-424-757-6. ^ "The Church of Alexandria". New Advent. Retrieved 17 March 2012. ^ "الأقباط متحدون - اللغة القبطية". ^ "The School of Alexandria – Part I – An Introduction to the School of Alexandria". Copticchurch.net. Retrieved 2 January 2011. ^ Apollinaris of Laodicea (1904). "Πρὸς Ἰοβιανόν". In Lietzmann, Hans (ed.). Apollinaris von Laodicea und seine Schule: Texte und Untersuchungen (in German and Greek). Mohr Siebeck Verlag. p. 251. ^ "Split of the Byzantine and Oriental Churches". Webcitation.org. Archived from the original on 26 October 2009. Retrieved 2 January 2011. ^ Greek Orthodox Patriarchate of Alexandria. ^ "Egypt". Berkley Center for Religion, Peace, and World Affairs. Retrieved 14 December 2011. See drop-down essay on "Islamic Conquest and the Ottoman Empire"
^ Romanides, John S. Leo of Rome's Support of Theodoret. ^ Kamil, Jill (1997). Coptic Egypt: History and Guide. Cairo: American University in Cairo. ^ Jerry Bentley, Old World Encounters: Cross-Cultural Contacts and Exchange in Pre-Modern Times (New York: Oxford University Press, 1993), 93. ^ Jerry Bentley, Old World Encounters: Cross-Cultural Encounters and Exchanges in Pre-Modern Times (New York: Oxford University Press, 1993), 93. ^ a b c "Saint George Coptic Church". Suscopts.org. Retrieved 3 April 2014. ^ "Pastoral Agreement between the Coptic Orthodox and Greek Orthodox Patriarchates of Alexandria". Orthodox Unity (Orthodox Joint Commission). 2001. Retrieved 14 March 2019. ^ Fahim, Kareem (20 March 2012). "Coptic Pope Shenouda III's Death Adds to Fears in Egypt". The New York Times. ^ "Muslim Brotherhood Sweeps Up Over One-Third Of Votes In Egyptian Elections". Huffington Post. 4 December 2011. ^ "Egypt". The World Factbook. American Central Intelligence Agency (CIA). 30 March 2016. Retrieved 5 April 2016. ^ Abaza, Khairi; Nakhla, Mark (25 October 2005). "The Copts and Their Political Implications in Egypt". Washington Institute for Near East Policy. Retrieved 5 April 2016. ^ Morrow, Adam (24 April 2006). "Egypt: Attacks Raise Fear of Religious Discord". Inter Press Service. Retrieved 5 April 2016. ^ "Egypt's Coptic Bishop Morcos: We need to build 4,000 churches in next 10 years". english.alarabiya.net. Retrieved 2 February 2018. ^ a b c Youssef, Abdel Rahman (30 September 2012). "Egyptian Copts: It's All in the Number". Al-Akhbar English. Archived from the original on 12 January 2013. Retrieved 5 April 2016. ^ a b "Egyptian Copts reject population estimate". Ahram Online. Retrieved 5 April 2016. ^ "The Coptic Orthodox Church in action – Al-Ahram Weekly". weekly.ahram.org.eg. Retrieved 6 May 2016. ^ Cairo, Jared Malsin in (20 February 2015). "'We want our sons back': fears grow for Egyptians missing in Libya". the Guardian. Retrieved 6 May 2016. ^ "Egypt must help its poor in response to Libya beheadings, economists say". america.aljazeera.com. Retrieved 6 May 2016. ^ "Egypt's Sisi meets world Evangelical churches delegation in Cairo - Politics - Egypt - Ahram Online". english.ahram.org.eg. Retrieved 26 December 2017. ^ Elizabeth Harrington (19 December 2011). "Number of Coptic Christians in Egypt Is Far Less Than Media Estimates, Report Says". Cybercast News Service. Retrieved 8 March 2015. ^ "What is the Coptic Church?". BBC Religion & Ethics. 2 November 2012. Retrieved 8 May 2018. ^ El-Hennawy, Noha (24 June 2008). "EGYPT: Coptic diaspora spreads the word". Los Angeles Times. Retrieved 5 April 2016. ^ Hassan, Abdel Salaam (1995). "The Copts" (PDF). In Verney, Peter (ed.). Sudan: Conflict and minorities. Minority Rights Group International. p. 26. Retrieved 5 April 2016. ^ "The Copts: Passive Survivors under Threat" (PDF). Africa Watch. 5 (3): 1. 10 February 1993. Retrieved 5 April 2016. ^ WCC official visit to Ethiopia World Council of Churches – News Release. 21 September 2005. Retrieved 25 November 2006. ^ Zaki, Moheb (18 May 2010). "Egypt's Persecuted Christians". The Wall Street Journal. Retrieved 4 June 2010. ^ Eltahawy, Mona (22 December 2016). "Egypt's Cruelty to Christians". New York Times. Retrieved 22 December 2016. ^ United States. Congress. Commission on Security and Cooperation in Europe (18 July 2012). Escalating Violence Against Coptic Women and Girls: Will the New Egypt be More Dangerous than the Old? : Hearing before the Commission on Security and Cooperation in Europe, One Hundred Twelfth Congress, Second Session, July 18, 2012. Washington, DC: Government Printing Office. Retrieved 8 March 2015. ^ "Masress : Sectarian tensions rise in wake of crime boss death". Masress. Retrieved 2 January 2016. ^ a b Cannuyer, 2001, p. 40. ^ "Saint Antony Coptic Orthodox Monastery". www.stantonymonastery.org. Retrieved 6 September 2015. Betts, Robert B. (1978). Christians in the Arab East: A Political Study (2nd rev. ed.). Athens: Lycabettus Press. ISBN 9780804207966. Christian Cannuyer, Coptic Egypt: The Christians of the Nile, “Abrams Discoveries” series, trans. Sophie Hawkes. NY: Harry N. Abrams, Inc., 2001. Meinardus, Otto (1 October 2002). Two Thousand Years of Coptic Christianity. Cairo: American University in Cairo Press. ISBN 978-977-424-757-6. Archived from the original on 20 May 2008. Morgan, Robert (2016). History of the Coptic Orthodox People and the Church of Egypt. FriesnPress. ISBN 146028027X. Partrick, Theodore (June 1996). Traditional Egyptian Christianity: A History of the Coptic Orthodox Church. Greensboro, NC: Fisher Park Press. ISBN 978-0-9652396-0-8. Butcher, E. L. (1897). Story of the Church of Egypt (in Arabic) (text file ed.). London: Smith, Elder & Co. ISBN 978-0-8370-7610-2. Iskandar, Adel; Hakem Rustom (January 2006). "From Paris to Cairo: Resistance of the Unacculturated". The Ambassadors Online Magazine. Retrieved 9 June 2007. Wikimedia Commons has media related to Coptic Orthodox Church. History of the Patriarchs of the Coptic Church of Alexandria – to 849 A.D.